Our 11.00 service began in April 2017 and has already proved popular, with many families coming every week. Together at Eleven is a new service with the needs of children and parents particularly in mind, though everyone is welcome. It is a shorter, punchier service, a Bible story aimed at youngsters, and contemporary singing, all presented from the big screen. The service is fun-filled with lively songs and hands-on activities. 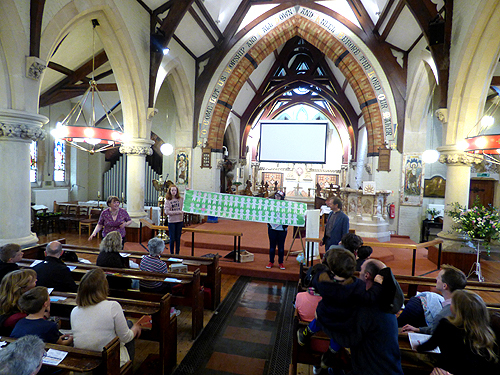 We listen to a famous Bible story with the whole family learning together. We also keep things punchy so that the service is less than 40 minutes long, and is followed by crafts and refreshments, with time for the children to play while the parents chat over coffee. If you are new to church, or just want a simpler structure to your worship, this is an accessible way to experience the love of God and grow your faith with like-minded people. So do come along and see for yourself. "We had a great start to our new 11.00 family service. 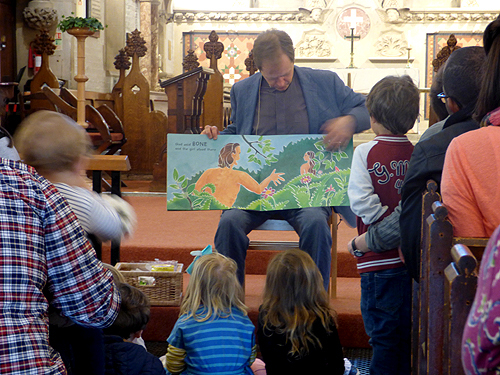 A good number of adults and children avidly listened to the storytelling, entered into the fun of the actions, joined in the songs of praise and helped make pieces of artwork."